Hank: Do you really believe the stuff that comes out of your mouth? Earl: I don't know till I'm finished talking. Poor Steve Zahn. Somewhere along the way the very talented actor became relegated to second banana parts in lame-brained motion pictures. The latest instance (if you don't count the utterly obnoxious Daddy Day Care) is National Security, a comedy in which he seems required to stand in as fodder for star Martin Lawrence and his never-ending riffs on today's culture. Normally the presence of Lawrence as a spotlight-stealer would be welcome given his undeniable comedic gift, but here his shtick feels tired. Zahn and Lawrence are Hank and Earl, two seemingly random strangers who are brought together through a series of unlikely events. When LA cop Hank loses his partner to a group of smugglers, he is relegated to walking the beat rather than solving his partner's murder. Earl is a wannabe cop whose time at the police academy was cut short after a series of unfortunate instances. Then on a fateful day, Earl locks his keys in his car and attempts to reach them by a half-open window; when Hank confronts him about this a scuffle ensues and Earl is stung by a bee. Swollen and looking as though he has been beaten, Earl is made a victim while Hank is carted off to jail. When Hank is released, he begins to work for a private security company where Earl is also employed, and through a series of events the two become partners to bring down the men who killed Hank's partner. While the plot for National Security has promise given the comedic way in which it confronts the issues of the "caught on tape" media frenzy, the film ultimately fails because of Lawrence's performance. Given the right subject matter, Lawrence is an extremely funny individual, but here his character is neither likeable nor heroic. The early scenes feature Lawrence berating everyone with regards to race, physical appearance, and even authority, so it is difficult to buy him as a protagonist later in the film. Though it is questionable whether this is the work of Lawrence's improvisation or the script by Jay Scherick and David Ronn, the angle the story takes toward racism feels tired and at times uncomfortable. While the subject matter is delicate and overused, had National Security brought a new face and wit to the proceedings, the dialogue would have benefited as intentionally humorous rather than questionable. Directed by Dennis Dugan (who has earned my respect for Happy Gilmore), National Security has a nice feel; the production is slick and the action sequences are competently handled. As mentioned above, Zahn is given no real task besides playing off of Lawrence and, given his talent, he does so rather well. With a much better script, Zahn should be given the lead role because he truly deserves it. Eric Roberts does pop up in what is undoubtedly a comeback attempt that falls flat. It is worth seeing Roberts in a silvery wig that looks as out of place on his head as his entire being does in this film. Image Transfer Review: Presented in both 1.85:1 anamorphic and 1.33:1 transfers, National Security looks great from the outset. Colors are very vibrant with terrific crispness and no bleeding evident throughout, while sharpness and detail are both consistently of the highest quality. I noticed a few moments of slight edge enhancement as well as several instances where flaws were evident in the print. Audio Transfer Review: The Dolby Digital 5.1 mix for National Security is far from groundbreaking, but given the action aspect of the film, the track does stand above other comedy mixes. The surround speakers are used quite often, giving the viewer an active soundfield that includes gunshots as well as other ambient sounds. The .1 LFE track is strong, and dialogue is clear and crisp throughout. Extras Review: The most substantial extra feature is a feature-length commentary track by director Dennis Dugan. Dugan for the most part discusses more lighthearted subjects, including casting and brief anecdotes, rather than delving into the technical aspect of the film. The track is fun, though at times it seems as if Dugan is struggling for things to fill the track. Two deleted scenes as well as an alternate ending are offered and each was rightly left on the cutting room floor. The most important of these is the alternate ending that is fitting for the tone of the film but rather preposterous. It is bland and goes on for way too long, much like the film itself. A music video for the song N.S.E.W by Disturbing Tha Peace is available and if you like rap music, I would imagine it is pretty good. Finally the trailers for National Security, Bad Boys II, and Charlie's Angels: Full Throttle are available in anamorphic widescreen with Dolby Digital 5.1 sound. 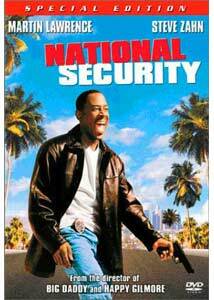 It would be wrong to say that I disliked National Security, as aspects of the comedy had me laughing, and to be truthful, I was involved in the plot as the film went along. But with the never-ending comedic delivery of Martin Lawrence overshadowing the proceedings, I can't recommend the film in the least bit.